Relax and enjoy a private getaway in one of our Damascus Cabins or bring a group. We have 4 cabins and can accommodate 18 people. We're located on the Laurel Creek in downtown Damascus, Virginia, "Trail Town USA." After a fun day of hiking, biking, or enjoying any of our area attractions, chill out in one of our cozy cabins. Old Fairview Cabin is a beautiful one-bedroom custom built log cabin. 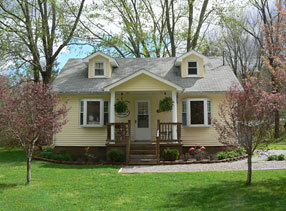 It is located just a few minutes from downtown historic Abingdon, Virginia and minutes from the Virginia Creeper Trail. 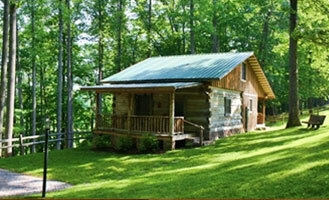 The cabin offers a relaxing and refreshing atmosphere and has a covered front and back porch. A pet friendly Auntie's Cottage is located a short walk to both the AT and the Creeper Trail for those interested in hiking and bicycling. 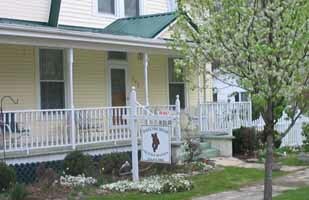 TheVirginia Creeper Lodge is the perfect place to bring the family or group for adventuring the area. 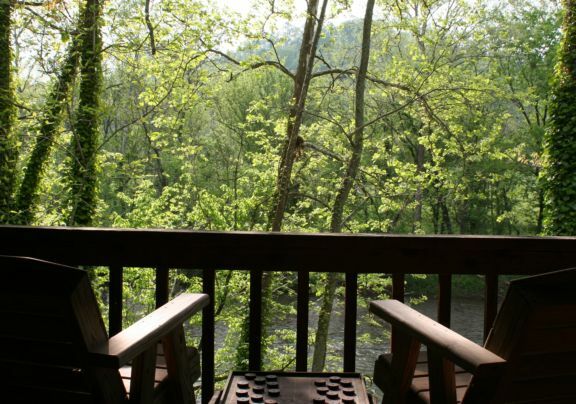 Enjoy the huge deck overlooking the Virginia Creeper Trail and the Laurel River. "A Humble Abode" is a lovely three-bedroom, one-bath house that has been renovated and updated to provide you with modern amenities. Your linens are provided, and the kitchen is equipped for as much or as little cooking as you want to do. Bed and Breakfast, Weddings and Events. Home away from home, a wonderful B&B. A quiet, lovely getaway that is open year round with each season offering its own activity opportunities. The best thing you will find is a special place to renew your spirit and pamper your body. The Hikers Inn a clean, comfortable , affordable, no frills place to stay. Located downtown Damascus Virginia where the closest stoplight is eight miles away. Our Creekside Cottage is a newly renovated, fifty-year-old family cottage, featuring a romantic setting and serene creekside accommodations. The famous Virginia Creeper Trail is just five minutes away so don't forget to bring your bikes! There is also great seasonal trout fishing! Nestled in the heart of Damascus, our B&B is perfectly located for a ride or hike on the trails, a splash in the river, a weekend break or a leisurely mid-week holiday.